A little explanation is in order. 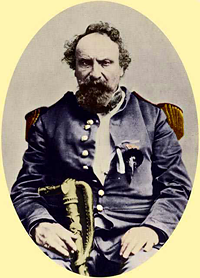 Thus began Joshua Norton’s 21-year reign over an amused and tolerant city — and a mostly unsuspecting United States of America. After losing a fortune in spectacular fashion five years earlier, the once-prominent businessman had dropped out of sight, re-emerging from self-imposed exile as a destitute but much more interesting character. Though the good Emperor’s sanity has been questioned on more than one occasion, his concerns sound alarmingly contemporary — we miss the stabilizing presence of his eccentric Imperial Majesty now more than ever. A reminder that the great Earthquake and Fire of 1906 was just another turn of the wheel for a city already quite accustomed to burning itself down. 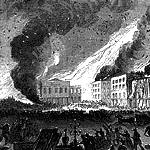 On the morning of September 17, 1850, San Francisco’s fourth Great Fire broke out. Great Fire #4 was a minor blaze in the series of six conflagrations which leveled portions of San Francisco in the early years of the Gold Rush. Four square blocks just north of Portsmouth Square were destroyed, the area between Washington, Pacific, Montgomery and Grant (then DuPont) streets. Luckily, the area had been scorched by Great Fire #3 just a few months earlier, so the typical welter of rickety wooden gambling halls, brothels, and rooming houses hadn’t yet been completely rebuilt. On September 19, 1899, Ringling Bros. Circus made its first appearance in San Francisco, setting up the big top at 16th and Folsom Streets. If the late September scheduling of today’s, um, “carnivalesque” Folsom Street Fair is merely a coincidence, well … I guess you can insert your own joke here. Breaking into the 20th century, Charles Lindbergh touched down at what is now San Francisco International Airport at the height of the Jazz Age. 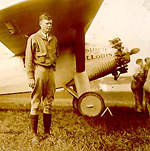 Lindbergh and his gorgeous aluminum aircraft, “The Spirit of St. Louis”, had just made aviation history by completing the first ever solo flight across the Atlantic Ocean. He was in the midst of a kind of victory lap around the whole country that summer, giving speeches and riding in parades in all 48 states. Hordes of spectators surrounded the runway that day and lined Bayshore Highway just to catch a glimpse of the now world-famous aviator. Western Union messenger boys go on strike, dramatically parading down Market Street and successfully breaking the Depression-era stranglehold of the company union. I don’t know about you, but somehow a scene from “Newsies” is running through my mind — I guess it’s all those little caps. In the heart of the Cold War, Soviet Premier Nikita Kruschev arrives in San Francisco during an American “friendship visit”. 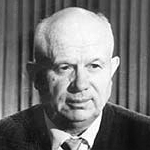 Kruschev remembers San Francisco with special warmth in his memoirs, noting that, in contrast to many other cities in the United States — I’m looking at you, Los Angeles — San Francisco treated the Soviet visitors with politeness and respect. “There were neither shouts nor gestures, although Americans know how to do such things if they want to show their hostility”. Kruschev, rather immodestly, later took credit for his visit having helped re-elect his host, Mayor George Christopher. No shoe-banging on this trip … that would have to wait until New York in 1960. The no-nonsense TV cop show “Streets of San Francisco” went on the air for a 119 episode, five season run. 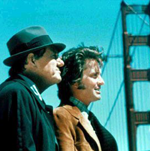 The father-son-like chemistry between Karl Malden and Michael Douglas combined with location filming in gritty ’70s San Francisco made it a classic. And here’s a little-known fact — one of the many unknown actors popping up in bit parts was California’s future Governator, Arnold Schwarzenegger. So very glad to have you back. Looking forward to each and every new episode. Since Feb, I’ve resorted to re-listening to past podcasts — sometimes more than once! What a great surprise :-) Couldn’t help smiling all my commute when my iPod surprised me with a podcast intro, I’ve been missing for so long. I loved the long episodes about single topics, so I hope you can slip in one of those once in a while, but the new format is great, too. I like the format. We’ve missed you. Welcome back! I liked the new format and I think it works well. Although the episodes are shorter, I feel you still maintain a solid and detail oriented podcast of San Francisco. Keep up the great work and I look forward to more! I’m very happy that Sparkletack is back! I was missing your podcast… well done! Brilliant! Glad to have a podcast after such a long wait, not that I’m complaining about the wait, I’m just grateful whenever you find the time to give us yet another brilliant show! It’s reassuring to get such a nice round of encouragement for something that’s so different from what’s come before, and so clearly a work in progress. The plan (now) is to have a new “Time Capsule” up every Monday morning, and work on the longer format stuff as time allows. Stay tuned, and keep the feedback coming! Welcome back! I really missed listening to my favorite podcast. Glad you’re back. Hope you’ll be doing some longer ones, but just listening to the new ones makes me a happy man. Great to hear you musings ’bout my fav city! I loved the episodes on long single topic, so I hope you can slide into one of those occasionally, but the new format is great.